Create QR codes from address-book contacts (was Contacts to QR Codes Pro). Is there a better alternative to Contacts to QR Conference Cards Pro? Is Contacts to QR Conference Cards Pro really the best app in Desktop Publishing category? 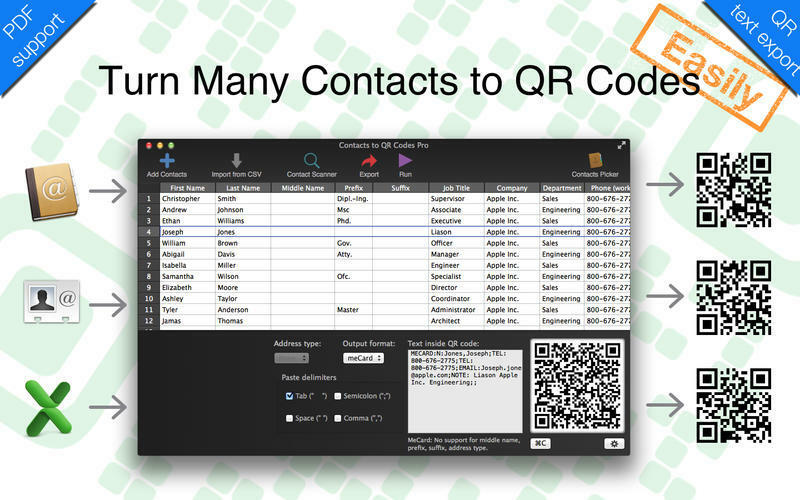 Will Contacts to QR Conference Cards Pro work good on macOS 10.13.4? Contacts to QR Conference Cards Pro (was Contacts to QR Codes Pro) lets you create many conference / meetup cards with QR codes, or just many QR codes for your business cards. Creating several QR codes for business cards / name badges can be a pain in the neck. With this application, you can add/import contacts and create conference cards or QR codes within few clicks. You can easily modify displayed data as you would work with Excel. All data can be saved for later purposes. This app also helps you organize contacts of your employees in one place (newcomer joins your team, your business relocates). Note: The downloadable demo is version 1.3. The version available for purchase on the Mac App Store is version 1.5.1. Contacts to QR Conference Cards Pro needs a review. Be the first to review this app and get the discussion started! Contacts to QR Conference Cards Pro needs a rating. Be the first to rate this app and get the discussion started!